There was no bibliography or added bibliography for this chapter. However, I want to expand a bit with respect to the chapter’s comments on interpreting the Bible in context. Generally, it’s time to get serious (i.e., stop with the hypocrisy) about interpreting the Bible in context. We live at a time when the languages of the major civilizations that flourished during the lifetimes of the biblical writers have been deciphered. We can tap into the intellectual and cultural output of those civilizations. That output is enormous—millions of words. We can recover the worldview context (their “cognitive framework” in scholar-speak) of the biblical writers as never before. The same is true of the New Testament writers because they inherited what had gone before them and were in turn part of a first century world two thousand years removed from us. Think about it. How would anyone living a thousand years from now understand something you wrote unless they had you inside their head? They’d need your frame of reference. They’d need to know what was going on in the wider world that potentially concerned, angered, encouraged, or depressed you. They’d need to understand the pop culture of your day to be able to parse why you’re using this word and not that one, or to properly process an expression. There’s no way to do that unless they recover your frame of reference. That is what it means to interpret in context — recovering the ancient frame of reference and interpreting accordingly. It’s polar opposite is acquiescing to the notion that the Bible is best understood in our context — our modern cognitive framework. That’s utterly anachronistic, but it’s where too many Christians live (pastors and lay people). More specifically, I want to say something about a criticism (perhaps well meaning, but nonetheless misguided) directed toward what I’m saying is essential to accurate biblical interpretation. Some critics of interpreting the Bible in its original ancient context presume it’s contrary to the Christocentric hermeneutic. I suppose that depends on how we understand that term. Many presume it means that no interpretation of any passage (especially the OT) is valid unless it “reveals Jesus.” Others seem to suggest that since Jesus was here, we now need to filter every passage through his first advent and work on the cross. I disagree with both sentiments — and also think that neither is really how we should think about “Christocentric” interpretation. The above approaches result in the loss of the original intent for which God providentially prompted passages in the OT. That isn’t a mere intellectual observation. It calls Providence into question. Does the Christocentric hermeneutic really demand that we avoid interpreting the OT in light of its ancient Near Eastern context? That we avoid interpreting the NT against those results — letting the original context of the OT inform the OT’s own contribution to NT exegesis? (If you’re wondering if this is even coherent, that’s troubling). The OT rightly understood in its own context will not violate what we read in the NT. What we read in the NT will be illuminated by the OT rightly understood. In many cases, it helps us make sense of “odd” things the NT writers do with the OT. In some cases, it will even correct our interpretations of how the NT writer handled the OT. And when we factor in Second Temple Jewish writers hitting a bulls eye in their own interpretation of the OT in its original context and allow those Second Temple writers to inform our reading of the NT, we get a double benefit. But should we just dump trying to do any of this since Jesus has come? 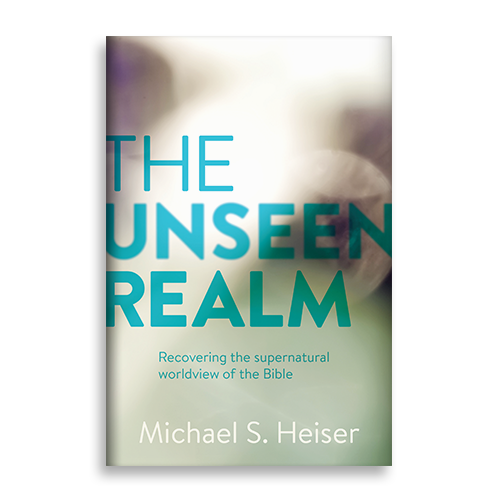 Frankly, what I’m doing in The Unseen Realm and the Christocentric hermeneutic (rightly understood) are not mutually exclusive. A real Christocentric hermeneutic doesn’t ignore the original context of any given OT passage in the name of making it say something totally different so it links comfortably with something Jesus did or said. Rather, a coherent Christocentric hermeneutic recognizes that all portions of the Bible, rightly understood in their original ancient context, play a role in the formation of a mosaic (or maybe I should say “meta-narrative”) that ultimately directs us to Christ. Everything in the Bible isn’t about Jesus and it doesn’t need to be to contribute to the progression and outcome of God’s plan for humanity—the person and work of Jesus Christ. In short, you don’t need to erase, eviscerate, or avoid any passage’s original context to get to where the Bible means to take you. Too often the appeal to Christocentricity is an excuse to avoiding the work to understand the text on its own terms or is an interpretive sleight of hand for misdirecting our attention away from a passage that’s odd or uncomfortable. That hardly honors God’s providential decision to prepare and prompt the biblical writers to produce the material they did – when they did so, for the reasons they did so, and from the worldview and cognitive framework they developed amid the life experiences God’s providence gave them. Put another way, a Christocentric hermeneutic doesn’t need to distort or erase anything in the OT. God knew what he was getting when he prepared and prompted people in the second millennium BC ancient Near East to write something he wanted written and preserved. Inspiration wasn’t an exercise in God doing something that he’d have to circumvent later so we could see Jesus.